For the first time this season, we have a major shakeup in the D1Baseball Top 25 rankings, powered by Louisville Slugger. The upheaval goes from top to bottom, starting with UCLA ending preseason No. 1 Vanderbilt’s five-week run at the top. The Bruins take over at No. 1 after winning two of three from Oregon State, which was ranked No. 3 heading into the weekend and falls four spots to No. 7. The Commodores drop to No. 8 after losing a road series at Texas A&M in the SEC opener. Mississippi State won the SEC’s biggest series to move up four spots to No. 2. The Bulldogs went on the road and took two of three from Florida, which goes from No. 5 to No. 14 despite a midweek win against rival Florida State. Florida’s fall reflects the cumulative effect of previous midweek losses, and other red-hot teams making big jumps. North Carolina State makes the biggest move in the rankings, rocketing from No. 20 to No. 6 after winning its ACC series against Florida State, which falls to No. 21 after a 1-3 week. The Wolfpack ran its season-opening winning streak to 19 games before dropping Sunday’s series finale against the Seminoles. HOW THE TOP 25 PERFORMED: It’s that time of the week! How did last week’s @d1baseball Top 25 teams fare over the past week? NC State’s loss means that Arizona State is the only unbeaten team in Division I. The Sun Devils improved to 19-0 — albeit against a relatively modest schedule — and moved up to No. 15. The other big movers included Auburn, up six spots to No. 12 after sweeping Tennessee (which falls out of the rankings), and Texas A&M, up to No. 13 after its series win over the Commodores. Teams that have sustained excellence through the first five weeks of the season deserved to move up. But big corrections in the rankings mean other teams get shuffled more than they would in a normal week. Ole Miss fell nine spots to No. 18 after posting a 2-3 week, even though it won its weekend series against Alabama. North Carolina and Coastal Carolina fell one spot apiece even after winning weeks, with the Tar Heels winning a quality series against Miami. East Carolina fell to No. 20 despite a 3-1 week, and Texas Tech fell eight spots to No. 19 after dropping two of three at Texas. Other climbers this week included Louisville and Georgia, up to Nos. 4 and 5 after sweeping quality conference road series. Texas moves up to No. 9 after its big series win against the Red Raiders. LSU and Arkansas climb to Nos. 10 and 11 after sweeping SEC series. Three teams enter the rankings this week, replacing South Carolina, Tennessee and Clemson, all of whom lost their weekends. UC Irvine and Oklahoma make their season debuts in the rankings at Nos. 23 and 25, and Michigan returns to the rankings at No. 24 after a one-week absence. 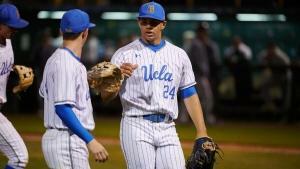 D1Baseball editors Aaron Fitt and Kendall Rogers determine the Top 25 rankings. Records are through games of March 17.